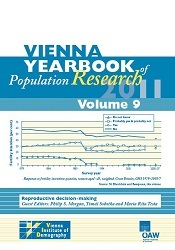 Maria Rita Testa, Tomás Sobotka and Philip S. Morgan: Reproductive decision-making: towards improved theoretical, methodological and empirical approaches. S. Philip Morgan and Christine A. Bachrach: Is the Theory of Planned Behaviour an appropriate model for human fertility? Maria Rita Testa, Laura Cavalli and Alessandro Rosina: Couple´s childbearing behaviour in Italy: which of the partners is leading it?